A weekly newspaper criticised for publishing a wraparound promoting the Conservative Party has run a front page advertisement for the Liberal Democrats. The Westmorland Gazette was one of many regional newspapers to run the Tory wrap earlier this month, but was subsequently made the subject of a 1,000-name petition from readers demanding an apology over what they perceived to be “political bias”. However, the Gazette is now running a front page advert promoting the Lib Dems in its current edition. Westmorland and Lonsdale is the constituency served by Liberal Democrat leader Tim Farron, who has been its MP since 2005. After running the Tory wrap, a number of editors came forward to defend the editorial neutrality of their titles – including Andy Parkes, Newsquest group managing editor for South London and Sussex, Jim Parker, Exeter Express & Echo editor, and Devon Live editor Patrick Phelvin. 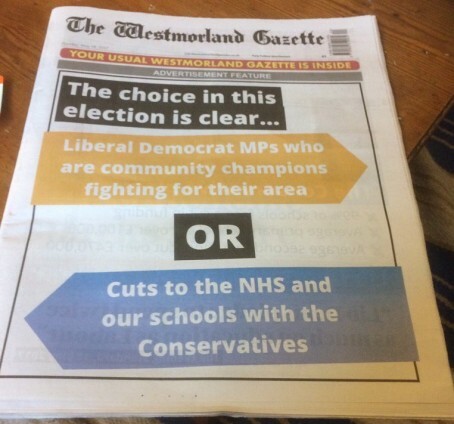 HTFP has approached the Westmorland Gazette for a comment on the Lib Dem wrap. 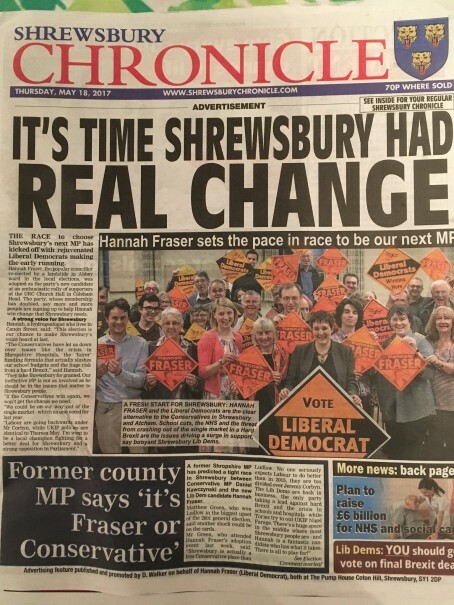 Last week, the Shrewsbury Chronicle also ran an advertisement for the Lib Dems on its front page. Shrewsbury and Atcham was last held by a Liberal Democrat between 2001 and 2005, following sitting Labour MP Paul Marsden’s defection to the party after he publicly opposed the war in Afghanistan. The seat has been held by Tory Daniel Kawczynski since 2005. They either just don’t get it or are blindly so desperate for any ad revenue they can get they’ll take as many political party wraps as they can get their hands on. Look at the latest sham front cover of the Shrewsbury paper and it’s huge banner headlines, tiny advertising qualifier and bottom right panel proclaiming ‘more NEWS on the back page .” and tell me many readers won’t think this isn’t the real front page? A political message clearly designed to fool readers into thinking this is genuine news on the papers real front cover yet again by incorporating the papers own masthead and with the editors apprval. Anyone mention integrity for sale ? It really beggars belief but does, as has been previously mentioned, show us just how desperate these publishers are for ad money and how little they value the worth of their papers in terms of credibility, look and overall integrity. Which is worse? A few harmless ads (really, could anyone doubt this is an ad?) or no paper? That’s the choice. There is no comfy compromise where you avoid the grubby world of commerce and keep paying your staff. Some of these armchair critics need to get real. However, the minute a political party approaches waving a cheque book those fine principles go out of the window. I’m sure the staff of the 46 local and regional papers that closed last year take comfort from retaining their ‘integrity’ to the end. This is happening now and it is happening fast. Find revenue or fail. I don’t remember complaints about wraps for car firms and I don’t think the paper wants me to drive only a Volvo because it accepts an advert by them. An ‘advert ‘ wrap for a car dealership, as awful as it looks, doesn’t pretend to be anything other than an advert. These political wraps are nothing more, as Watching says, than fake news, created in the style of the paper in an effort to come across as a genuine front cover.,allowing them to be published just because it brings in revenue for one week and which will make no difference to the future security of the publishing business but will turn potential advertisers off and lose the paper credibility,two factors which can indeed affect people’s jobs and not in a positive way. Jean, are you from an advertising background or a journalism one? I genuinely don’t want this to sound patronising, but if this has to be explained to you then you’ll never understand anyway. Journalism is supposed to be unbiassed, independent and (largely) apolitical, the underlying principle of the whole profession is that it’s without fear or favour. Now, there are newspapers – notably Fleet Street ones – that do back parties but they make that backing explicit, more often than not the people buying that paper already agree with that line. But this is not the same, this is adverts masquerading as copy, designed to make it look like a trusted local paper is taking a stand for one party. A newspaper isn’t just a pile of words nor is it a product, it’s trusted to elevate a story about its own desire for cash, once that trust is lost it seeks to be relevant. Also, you talk about job losses – it’s not the lack of political wraparounds that caused those job losses – it’s the top brass at these newspaper groups mismanaging them. One of the main ways they mismanage them is through stunts like this, losing a century of credibility in only one edition and losing customer/reader loyalty and trust. So, that’s your answer. Mismanagement. You would have done better. Yet the epidemic is not confined to one newspaper group, nor one country. It is a universal advertising and circulation decline that’s crippling thousands of papers, whether they are regionals or nationals, independents, large groups or small. You ask us to believe that all their bosses were idiots and, given a free hand, you could save the industry, or at least your title, through some ivory tower principles. It’s a structural decline based around a changing world. It’s about Facebook and BBC online, not principles and trust. Who has trust in FB news? Yet their revenues are strong. Some papers are doing better managing that decline but all have had to elevate the drive for cash. Pretending we are still in the 1970s will only hasten the decline. Jazzie , south side johnnie and Jeff jones make the case very well. This is about fake news and editors happy to allow their titles to be wrapped ( as in completely covered up) by a political party pushing their message across in the guise of actual news,the publishers add weight to this by allowing it to happen in the first place and then by including their mast heads on the advert for what? , a weeks money which will do nothing to secure jobs and will only damage the papers credibility as a credible news medium and an effective vehicle in which to advertise a local business,to say nothing of the many ( yes many) people who will see this as a genuine cover with the publications own views and comment being published, not see it as a paid for ‘advert. This is the aim and this is why these political wraps, as opposed to commercial businesses; furniture warehouses,motor dealers etc whose wraps are seen as nothing more than advertising. Yes majority of the main publishers have mishandled the business for years, ignoring the warning signs, looking the other way in the face of new alternate media and had become complacent to the extent of arrogance in believing the new sources of news and how people accesss news would not affect them and that their readerships and ad revenue streams would always be there. The result of this arrogance and naivety sees copy sales at all time lows, and falling, ad revenues on the floor and not covering costs and content dumbed down to a level including a greater reliance on RGC and social media lifting so fewer people feel the need to buy a paper and with fewer local businesses seeing these papers as effective ad platforms, thus some are forced to accept such desperate commercial measures as this,political wraps passing themselves off as real news in order to get some ad money in. I also dobut these wraps carried a huge loading to refelect the prominence of the positioning so will have achieved very little in revenue terms of that alone was the aim. FB news is irrelevant in this matter and I don’t think Jeff or anyone is offering a solution other than to point out and decry the fact that this type of commercial sell out will only harm the papers credibility going forward and without credibility in a commercial world you’ll soon lose what few customers ( readers and advertisers) you currently have. Without credibility in a competitive market of new media and strong independent publishers you have very little of value to offer, and that WILL affect jobs. Yes, I appreciate the comments being made by Jeff Jones and South side Johnnie, I know where they’re coming from. I’m uneasy with the political ad wraps and glad my paper hasn’t carried one (yet). But to dismiss Jean’s comments out of hand is to bury your heads in the sand, too. Very many pundits on this website yearn for some perceived golden age in the 70s. Bad luck. The world HAS changed. Newspapers/media outlets have a different, still changing business model. Jean has also been patronisingly, snobbishly asked whether or not he/she is from a journalistic or advertising background. Mindful of being accused of being a person in a glass house, frankly, some of the comments other than Jean’s above need a good subbing. This isn’t a hark back to the ‘good old days’ when paper sales were at record highs and the strength and reputation of the local paper made it an essential part of local life, and as a result advertising pretty much sold itself, everyone appreciates the times have changed but publishers in the main have failed to move with the times in order to compete meaning sale teams have a very weak product portfolio to offer ,this is the opposite,it’s about selling the prestige and credibility of the local paper to the highest bidder from the political parties in the form of a 4 page wrap aiming to pass itself off as genuine news and the views of the publishing paper. If this is how desperate some publishers have become to have to take this kind of ‘advertising’ I suggest their commercial and advertising teams need a serous and radical review. It’s seems anything is acceptable as long as it brings in money. TM announced yesterday ithat it will be conducting a 4 month audit and review of its commercial operation amid falling revenues and under performances and it’s one I wholly applaud, more publishers should follow suit ,its about time all ad department were scrutinised in order to cut out the deadwood and to put their sales operations back on a footing best able to cope and compete with new media and strong,local 21st century competitors, be they in print or online , rather than having to scrape a barrel such as taking political wraps just to get any ( albeit much needed), ad revenue they can get their hands on. I really don’t think I am missing the point about the political wraps. I get it and I said so in my previous post. I just felt it was unfair to pillory Jean for stating uncomfortable truths about the industry today and its changing business models. When I started out, newspapers were still making money hand over fist in spite of themselves, not because they were being run better than now. There was an enormous amount of waste and profligate spending; frankly, I benefited from some of it early in my career. Until the late 60s, newspapers had no competition, apart from other newspapers. Then came local radio, more regionalised TV, then the big one, the internet. With the technological changes in production to overcome as well, it’s been and still is a rough ride. I’m not sure some of those who attack newspapers as they now are appreciate all of that fully. Jean. Factually your are right. Financial reality (desperation) drives this. But I don’t see why people cannot criticise it from a journalism point of view. It stinks but sadly journalism is at its lowest point since the Bible was late with the news. It’s not about harking back to a mythical golden age, and that’s a cheap shot anyway. It’s not about newspapers versus digital; it’s about credibility. Print still makes vastly more money than digital despite digital having been used as an excuse to starve print of resources for a decade and more in expectation of an online boom that never came, and almost certainly never will (because news groups’ management are so far behind the times that they’ll never catch up). Print still has a status that digital will never match; why else do you think the political parties want to be all over it? They’re buying into the papers’ reach and credibility, and in doing so helping to destroy it. My paper ran a Tory wrap this week. Within an hour of it hitting the streets we were getting letters from long-standing readers saying they’d never buy it again. All made the point that they weren’t doing it because it was a Tory ad, but because we’d sold out. Which we had, because we’re desperate, because the same people who ordered us to run a politlcal wrap have been sacking journalists and slashing budgets for years and now the product’s so devalued that they don’t see anything wrong in it whoring itself to the highest bidder. We have almost no journalists left, very little actual news, no time or opportunity to go out and find it, websites that are crammed with lists and pointless garbage of one sort or another, but in our paper we still have a product people respect and trust. And we’ve betrayed that. Simple as.